Michael Baron handed me a little broken piece of grey material and said, "This is what started the whole thing. I was in Germany celebrating my ninth wedding anniversary, when I noticed a building being constructed with this stuff. I picked up this piece and couldn't believe how light, and yet strong it was. The more I looked around the area, the more construction I noticed using it; in fact it turns out to be one of the most popular building materials in Europe ." And for good reason: Aerated Autoclaved Concrete (AAC, or AerBlock as Michael calls it) has a long list of impressive attributes that make it an excellent building material. First created in Sweden in 1929, AAC was introduce to the United States in 1996 and has been slowly gaining adherents here. If Michael has his way, AerBlock will be exploding in popularity. 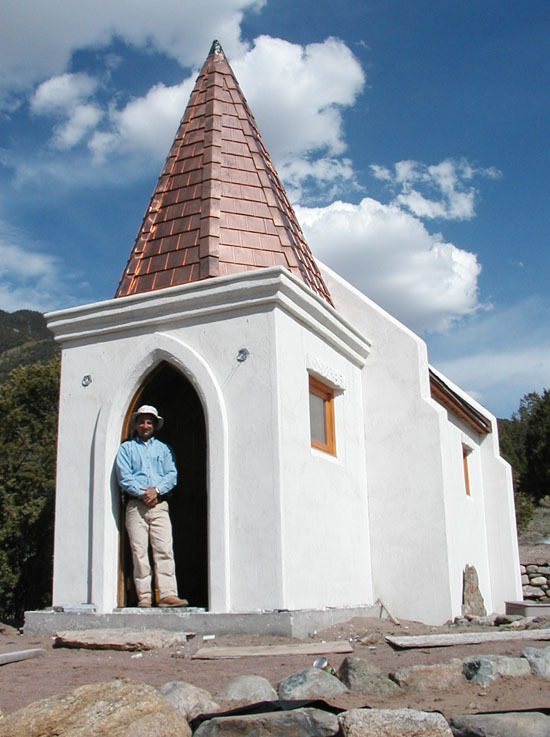 Already there have been about a dozen projects in his home town of Crestone, Colorado alone, from Tom Vlach's charming miniature chapel to the impressive three-story Pundarika Foundation residence designed by Tousan Saryon. Michael has become the Pied Piper of AerBlock because he believes it is the perfect building material. It is light-weight, so it is easy to lift the blocks, and because of all the trapped air, it is a good thermal insulating and sound deadening material. 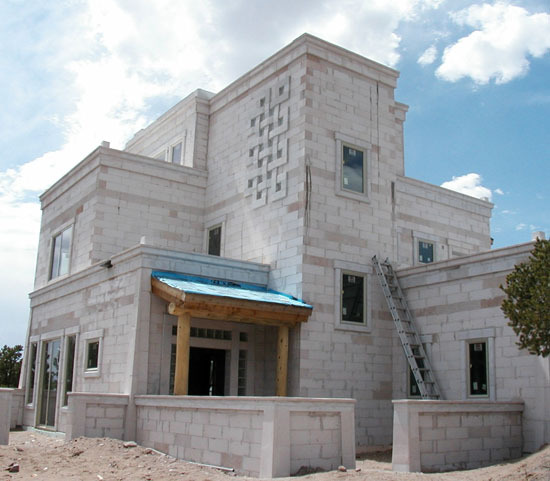 Since it is masonry, it is completely fire proof and very durable, without harboring insects, rodents or mold. It is quite easy to build with and very versatile in the style of projects that can be accomplished. It is environmentally benign in that the material does not off-gas and can be installed as a breathable shell for habitation. The cost of building with AerBlock is comparable to many other building systems. The process of manufacturing AAC is worth explaining. The basic ingredients are very simple: water, fine silica sand, Portland cement, lime, and a pinch of aluminum powder. These materials are mixed and placed into a large vat where a chemical reaction occurs that causes the mixture to expand like rising bread dough. Up to 80% of AerBlock is air. The curing process releases hydrogen gas, which is completely benign. Within a short while the dough can be sliced by pushing it through some taught wires. The autoclaving part of the process begins when the slabs of dough are placed into a heated and pressurized tank for about half a day. 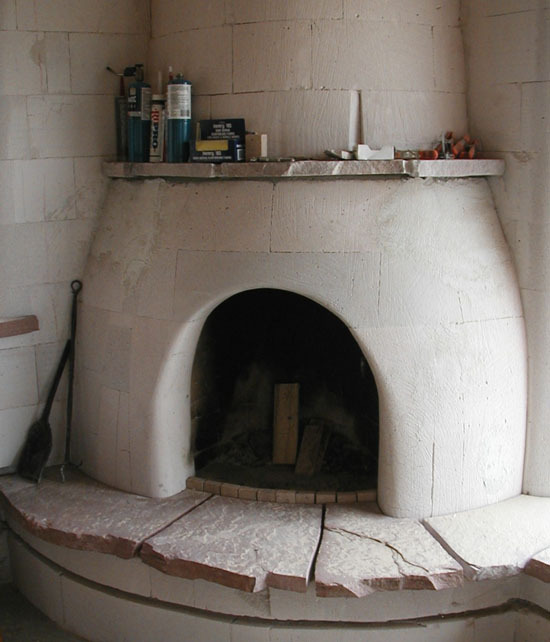 During this curing time the material undergoes another chemical transformation and becomes Tobermorite (calcium silicate). At this point the mineral is completely inert and ready to be cut and shaped into a variety of forms useful for construction. AerBlock can be worked with common wood-cutting tools, but because of its abrasive nature such tools will quickly dull unless they have carbide or diamond tips. The malleable quality of AerBlock is one of its most useful attributes, as it lends itself to the fabrication of virtually any shape. Decorative embellishments, rounded corners, arches and niches are all easily accomplished with this material. The blocks or decorative pieces are simple "glued" together with standard tile-setting Thinset material, producing a joint that becomes stronger than the material itself. Because the surfaces are typically in very close contact, the joinery must be much more precise than standard concrete block or brick work. Depending on the needs of the specific design, provisions are made for reinforcing walls, lintels, bond beams, etc. with grouted steel, which can create a structure that is resistant to earthquakes, high winds and such. In this way it is even possible to make floors and roofs with properly designed AerBlock panels. Once the building is erected and any electrical or plumbing elements have been embedded in the walls (by simply cutting channels), then both the interior and exterior can be plastered with a wide variety of finish materials. AerBlock makes an excellent substrate for both commercial and earthen plasters, and Michael showed me some lovely examples of both. He is even experimenting with mixing the AerBlock dust produced by cutting it with Gypsolite to make a very durable plaster. 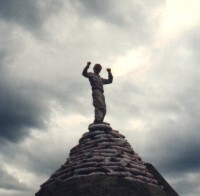 In fact all of the debris from building with AAC can be ultimately recycled. Standard blocks are 2 feet long and 8 inches high, with varying thicknesses from 2 to 12 inches. Michael represents two different manufacturers, so that he can provide blocks of differing densities for specific applications. The less dense material makes for better insulation. Special wall panels can be ordered pre-cut from the factory and assembled with a crane to create an entire shell within a day. As with many structural materials, there is some question about exactly how good AerBlock is as an insulator. The manufacturers point out that the conventional measurement of R-value can be misleading, when the overall performance of the building as a system is considered. For instance the static R-value of an 8 inch AerBlock wall might be about R-8, but in reality in a given climate and building design, the effective R-value could be R-16. This is because of the thermal dynamics of the material's ability to slow down the passing of heat over time. Because AerBlock is a masonry material, it has some behaviors associated with the ability of such materials to store heat (thermal mass), but this attribute is really minimal in this case because of all of that trapped air. There is no material that is excellent at both insulating against and storing heat. A smart designer, well versed in passive solar design, will choose highly insulating materials for most of the shell of the structure, and then introduce thermal mass components in the interior in appropriate places to moderate the interior temperature. In some moderate climates one can relax this rule somewhat, but in most locations there is reason to maximizing the shell insulation and use the thicker 12 inch AerBlock material. Since I am an advocate of sustainable building practices, I feel I should evaluate AAC according various sustainable criteria. Michael claims that AerBlock is the world's most environmentally green building material, but I wouldn't say that. It is pretty good in this regard, but any non-industrial, earth-based or renewable technique (such as straw bale, adobe, cob, rammed earth and earthbag building) is more green because the embodied energy is much lower. Not only does AAC require a great deal of energy to manufacture, but it must then be transported to the job site. At present the manufacturing plants are in Florida, Georgia, Arizona and Mexico . Of all the manufactured building systems that I have studied, I think AAC is the best overall. Because it is primarily an insulating material that does not off-gas nor harbor pests, is breathable without absorbing moisture, is light and easy to work with, is extremely durable, and is flexible in design possibilities, it is superior. One thing that intrigues me about AerBlock is the potential for pre-cut kits that could be assembled onsite by just following a numbered system. Imagine the lovely, elegant architectural forms from around the world that could be recreated this way. For more information about AerBlock, I'm sure Michael Baron would be happy to communicate with you (719-256-4836 baronATaerblock.com) or check out his website: www.aerblock.com. I specifically disclaim any warranty, either expressed or implied, concerning the information on these pages. Neither I nor any of the advisor/consultants associated with this site will have liability for loss, damage, or injury, resulting from the use of any information found on this, or any other page at this site. Kelly Hart, Hartworks LLC.